All LeadsPlease mailing lists include USPS ‘preferred’ and ‘acceptable’ city names only. This means that when you buy mailing lists from LeadsPlease, you are receiving top quality addresses, formatted in accordance with USPS requirements. This ensures that more of your mail will get delivered quickly and accurately. Some zip codes are associated with several different City names, so the USPS designates ‘preferred’ and ‘acceptable’ city names to minimize confusion and speed up mail delivery. For example : there are 14 different city names associated with zip code 08008 in New Jersey. That’s a lot of different city names! 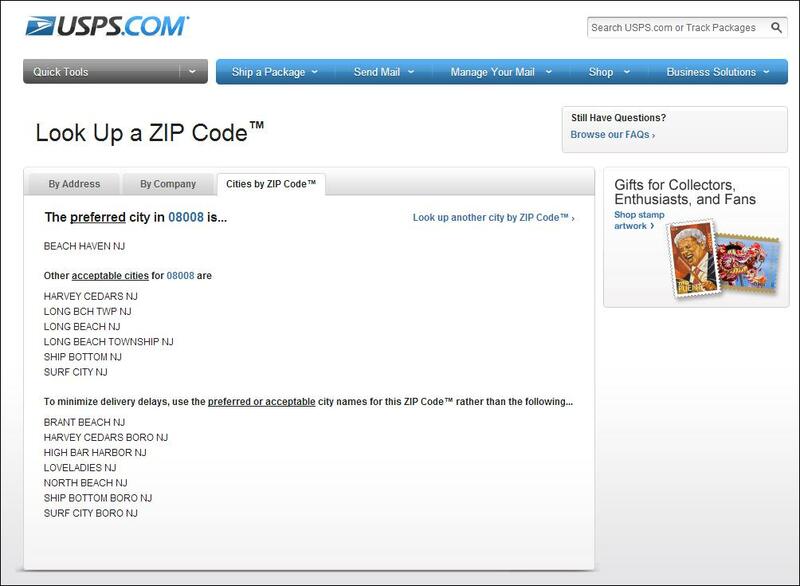 So the USPS chose 1 ‘preferred’ city name for this zip code (Beach Haven) and 6 other ‘acceptable’ city names (see below). If you use a city name that is not either the ‘preferred’ or ‘acceptable’ city name on your mailing piece, your mail may not be delivered accurately. You can look-up any zip code in the USA by visiting the USPS site online : USPS Look-Ups.